There are so many good knitting books around. 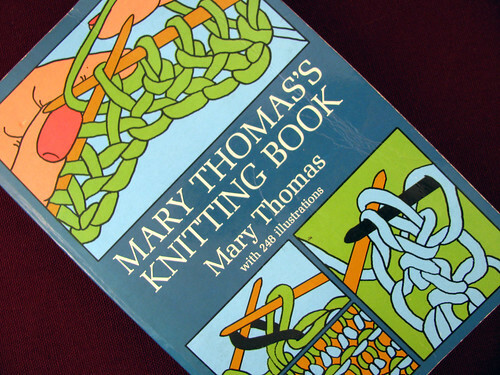 The Dover reprint of “Mary Thomas’s Knitting Book” (1938) is one of my favorites. This is the book that really explained to me what knit and purl stitches look like and how they are formed. It goes over all styles of knitting by country of origin. When I was casting on the Glynis socks, I looked through several other knitting books for suggestions, since my long tail cast on was too tight for a sock top. I read all the directions and still was not sure how the loops of the cable cast on were placed on the left needle. Only Mary Thomas’s book gave me enough information to know exactly how the stitches should be placed. I may be partial to this book since it is the one I read cover to cover when I was learning to knit. It is not an expensive book, so may have been my only choice at the time, more then 30 years ago. I highly recommend this book to anyone that doesn’t need a flashy book, but wants detailed information to understand the art of knitting better. This entry was posted on Saturday, April 18th, 2009 at 3:00 am and is filed under Knitting. Tagged: Book, Knitting. You can feed this entry. You can leave a response, or trackback from your own site.